Have friends in different parts of the country or in the region that you don’t get to see very often? A Girlfriends Getaway is a perfect way to carve out the time to catch up and the award-winning Chocolate Turtle B&B is just the place to gather. Several options are available—for a small group or just a couple of friends. New Mexico is easy to get to from most parts of the US, and the Chocolate Turtle is centrally located in the charming, historic farming Village of Corrales, NM—just 25 minutes from the Albuquerque Airport. Packages can be customized to meet your specific requests. Contact us for more information or read through some of our packages below. Prefer to explore the area with friends and experience fine dining one evening—we can offer that too. In the Village, explore our three wineries, galleries featuring local artists, a variety of specialty shops including a top-rated quilt shop, antique stores (many additional ones are nearby), as well as walks on nearby trails along the acequias, and bird watching (the Bosque is a stopover for 183 species). We have a special relationship with the Rio Grande Trading Company near Old Town Albuquerque. Special arrangements can be made for a private tour and shopping experience. The Chocolate Turtle has a membership to the exclusive CASA RONDENA Winery and Vineyards private 1629 Club. You will be welcomed at the mansion as our personal guests. Enjoy the grounds, wine, wood-fired pizzas and tapas. Escape to the Chocolate Turtle for a romantic getaway. A beautiful bouquet of flowers that will go home with you will be awaiting your arrival. Begin to unwind—relax and enjoy snacks and beverages—then put your feet up and watch the Sandia Mountains perform their magical transformations. 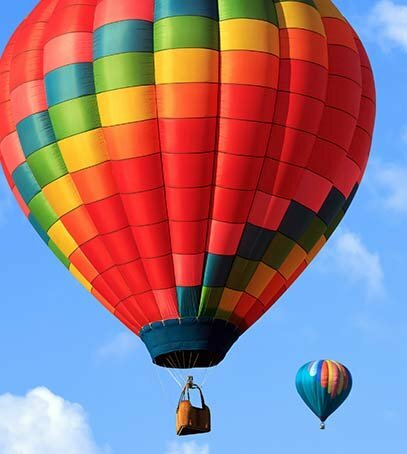 Escape to the Chocolate Turtle for a special ballooning adventure. Fresh flowers and chocolate turtles awaiting your arrival is a signature of the Chocolate Turtle Bed and Breakfast. We'll supply the snacks and beverages—then put your feet up and watch the Sandia Mountains. An early morning breakfast snack will get you started before you head out for your ballooning adventure for two - which includes a traditional first-timers' ceremony with a pin and certificate, followed by a light continental breakfast. * Package is not available from Sept. 25 - Oct. 15, 2011.